Prototype: ROBEL X630 powered track car as a construction site vehicle for the Austrian Federal Railways (ÖBB). With a movable loading crane. Used for maintenance and monitoring. The unit looks as it currently does in real life. Model: The model has an mfx+ digital decoder and extensive sound functions. It has controlled high-efficiency propulsion. The model has a compact design maintenance-free motor. 2 axles powered. 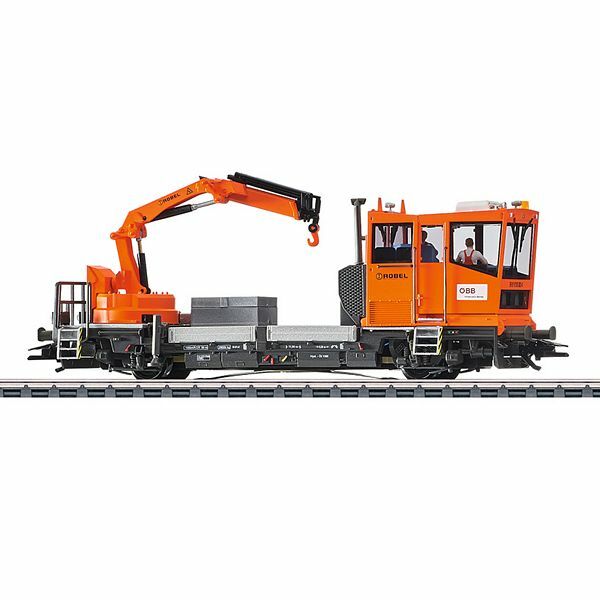 The model has separately applied grab irons on the cab. The triple headlights and dual red marker lights change over with the direction of travel and can be controlled digitally. The headlights at Locomotive End 2 and 1 can be turned off separately in digital operation. The model has the double "A" light function. Maintenance-free warm white and red LEDs are used for the lighting. The cab has interior details and controllable interior lighting. The loading crane can be turned by a motor and can be controlled digitally. Length over the buffers 13.4 cm / 5-1/4". Loading crane can be controlled digitally. mfx+ digital decoder and full sound features included. This product was done in cooperation with the firm Viessmann Modellspielwaren GmbH.